THE RUINS OF THE NUBIAN TEMPLE OF KALABSHEH, BUILT IN THE TIME OF THE ROMAN EMPEROR AUGUSTUS. 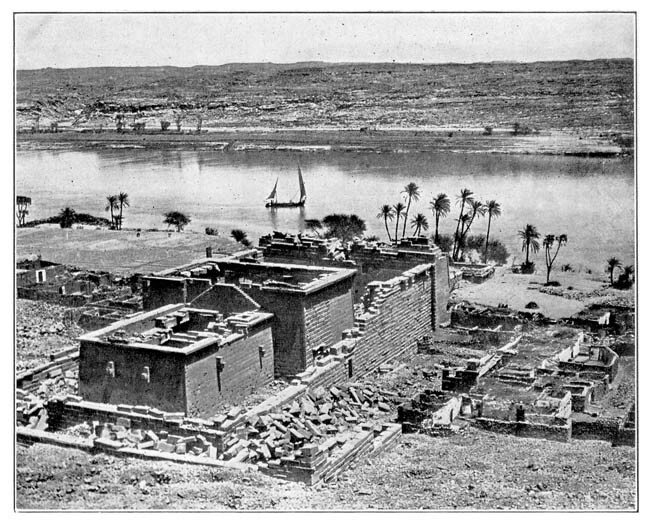 Now of all this precious inundation water and the rich manurial matter which it contains, an enormous proportion still runs to waste, for I believe it is calculated that nearly 37,000,000 tons of solid stuff are deposited annually from the Nile into the sea, carried by over sixty-five billion cubic metres of water. The object of modern engineering and science is to prevent as large a part as possible of all this richness from thus running to utter waste. The desert borders of narrow Egypt consist of sun-scorched, wind-driven sand. But if water from the Nile can be brought over this sand, instantly as though by the touch of the wand of a magician it becomes a most opulent soil. In the same way if the said water can at will be let on to lands already naturally inundated after that inundation has gone down, instead of one crop they will produce two or three, for in a country devoid of rain artificial irrigation is everything. So long ago as the middle of the last century a great barrage was begun above Cairo, which after many vicissitudes and much failure was at length completed in 1891 with splendid results to the land below. But a barrage is not what many people suppose it to bea dam; it is a guiding wall which turns water in any direction whither it is wanted. 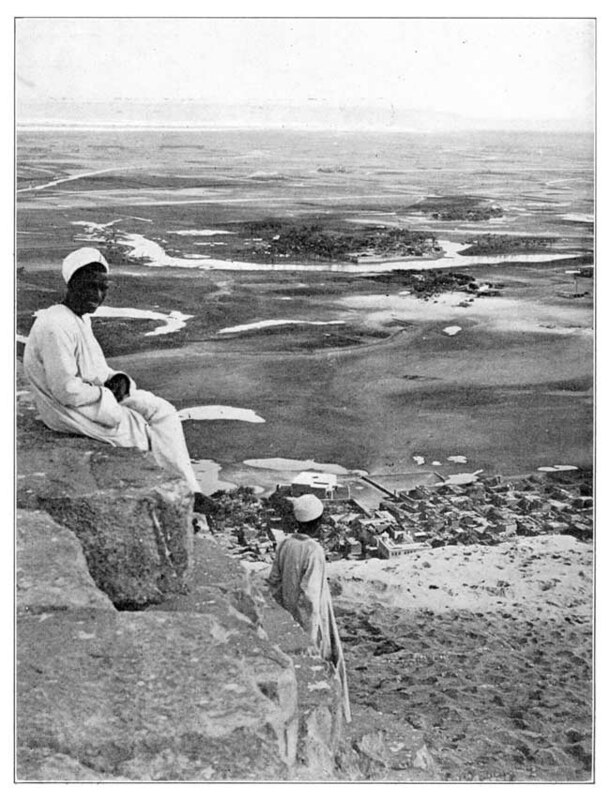 Soon it was felt that what was really needed was a huge dam at Assouan to be supplemented by a barrage at Assiout about three hundred miles lower down the river, which would direct the waters released by the dam in the dry season, into canals that could otherwise receive little or none at this time of year. 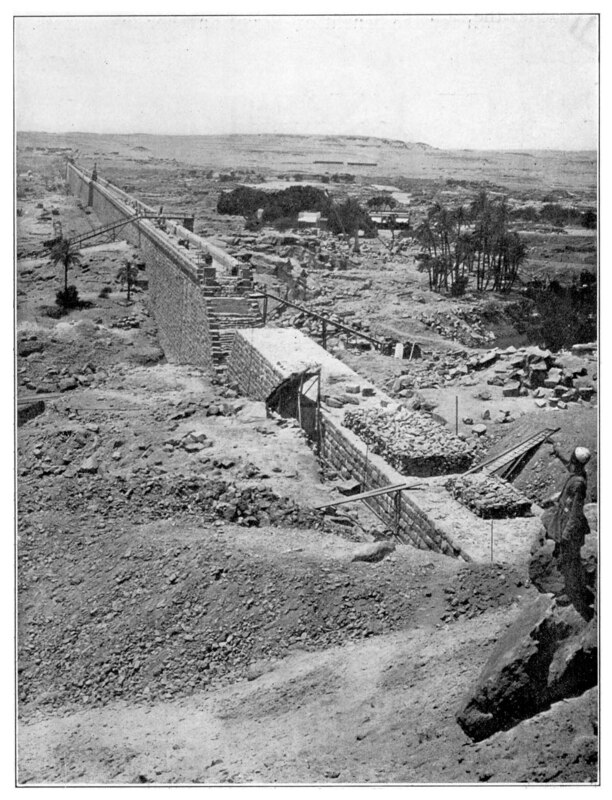 This Assouan dam, which cost about £2,000,000, was completed in the year 1902. A wondrous work it is to see, one indeed of which the old Pharaohs would have been proud if their engineers could have found the skill to build it. A mighty granite wall over 2,000 yards in length is set across the Nile from side to side. Above it to the south is a huge lake, in places nearly two hundred feet deep, formed by the waters of the river which the dam holds up for a distance of nearly 150 miles. In this wall there are 180 sluices worked by machinery, whereof more or less can be opened as is needful. Never till I stood upon that dam watching the waters of the Nile tearing through certain of these sluices, did I quite understand the possibilities of force. THE GREAT DAM AT ASSOUAN. THE VALLEY OF THE NILE FROM THE GREAT PYRAMID. Contact us if you would like reproducible copies of them.